It\'s a small, free download, simple instructions and strangely addictive to play. Clickomania may appear easy at first sight, but once you start playing, the challenge will soon confront you. Just as I finished writing the review, a brand spanking new major update to Clickomania was released. It\'s a good thing too...this new version has new twists to the game and better graphics. I\'ve been playing Clickomania off and on since around 1998/1999 and this new update is a very welcome addition to the series. The game is simple. Try to rid the game screen of all the blocks. 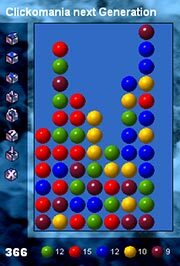 The catch is, you need to click on blocks which have at least one other block of the same color adjacent to it. As you begin to click around, new patterns form, opening up new possiblities of what to click on. The game is addictive as you strive to completely clear the screen. You will need to think ahead as each move can drastically change the layout on the screen. It\'s addictive, fun, and easy to find yourself still playing an hour later. The sounds are minor and few. A Kaboom! when you clear some blocks and a horn honk when you click in an illegal spot. The graphics have gotten better with each release. With the new release, the blocks (actually they are now balls) have a 3-D look to them. The interface has been completely revamped and has a very professional and polished look. There is nothing offensive in the game. You are clicking on blocks to remove them from the game screen. There is a top ten best score list which starts out with some funny names as the default. Some of these names may not be appropriate for younger children (Placenta Belle and Hu Flung Dung, for example). This is a free and small download. The new release adds some new gameplay elements to an already fun game. Why not give it a try and let us know what you think.